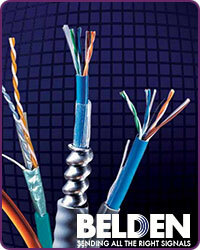 Belden Wire and Cable at HAVE, Inc. - HAVE HAS IT! Belden is a brand customers count on for product performance and reliability, whenever and wherever they need to transmit a signal. With over one hundred years of providing reliable cabling products, and offering a full-line of high quality, high availability industrial cabling and connectivity solutions including multi-conductor, paired, coaxial, flat and optical fiber cables, plus portable cordage, molded cable assemblies, hook-up and lead wire. As a full-line supplier of the entire Belden line of wire and cable, we'd love to work with you for all your Belden cable needs! If there is a Belden product you need that you don't see here in our store, just send us an e-mail or call us at (888) 999-4283 and we'll get it for you!